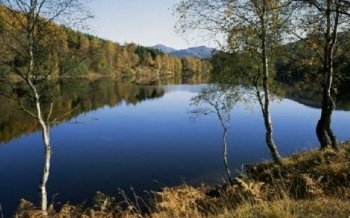 Loch Tummel has one of the outstanding beauty spots in all of Scotland. The Queen’s View is where a panorama of lake and mountain scenery stretches westwards as far as the Glen Coe hills, on clear days. Canvas Print (101cm) by Robert Harding . There is just a little doubt about which Queen is meant. Victoria certainly visited it in 1866, when travelling privately - “incognita” as she so correctly puts it. Her Journal for Wednesday 3rd October tells of a long drive she took from Dunkeld. by Dalguise and Aberfeldy to Kenmore, in time for lunch by Loch Tay at 1:30 p.m. They went on by Fortingall and past Coshieville, up the very steep hill, and on to “a dreary wild moor, passing below Schiehallion one of the high hills, and at the summit of the road came to a small loch, called Ceannairdiche. Soon after this we turned down the hill again into woods and came to Tummel Bridge, where we changed horses. Here were a few, but very few people who I think from what Brown and Grant said recognised us, but behaved extremely well, and did not come near. This was at twenty minutes to four. We then turned as it were homewards, but had to make a good long circuit, and drove along the side of Loch Tummel, high above the loch, through birch wood, which grows along the hills much the same as about Birkhall. It is only three miles long. Here it was again very clear and bright. At the end of the loch, on a highish point called after me ‘The Queen’s View’ - though I had not been there in 1844 - we got out and took tea. But this was a long and unsuccessful business; the fire would not burn, and the kettle would not boil. At length Brown ran off to a cottage and returned after some little while with a can full of hot water, but it was no longer boiling when it arrived, and the tea was not good. Then all had to be packed, and it made us very late. It was fast growing dark. We passed Alleine (now Queen’s View Hotel). . . and then at about half past six, changed horses at the Bridge of Garry near, or rather in the midst of, the Pass of Killiecrankie; but from the lateness of the hour and the dullness of the evening - for it was raining we could see hardly anything. which, though perhaps not totally authentic, might still have a basis of truth. In any case, the Queen’s view well deserves its regal title. Nowadays the Forestry Commission have an information centre there, where you can find out all you want to know about the work of the Commission. 500 yards along the road is a picnic area, which affords a fascinating glimpse of village life as it must have,heen in the eighteenth or seventeenth centuries. Some ruined houses and byres have been unearthed, partially built up, and given turf roofs.